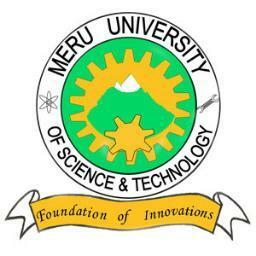 Meru University of Science and Technology (MUST) wishes to recruit qualified and dedicated staff to fill the following vacant positions. A Master’s degree in the relevant field from an accredited and recognized University (in special cases like Medicine and Architecture ) with at least three (3) years teaching experience at University level or in research or in industry. Have a Bachelor’s degree or Higher National Diploma or equivalent and a Master’s degree qualification from accredited and recognized University in the relevant field. Be registered/ registrable for Doctor of Philosophy (Ph.D) or equivalent Doctoral degree qualification. Applicants are invited for post of Learning Management System Administrator. Have a Bachelor’s degree in IT, Computer Science or related field from accredited and recognized university. Have training in Learning Management Systems. Have knowledge in web-based technologies. Have competence in database management. Have at least three (3) years working experience with Moodle, Blackboard or similar online educational platforms in a busy institution of higher learning. Applicants are invited for post of Technologist in Environmental Health, Botany, Biochemistry, Zoology and Medical Engineering. Have 2 years working experience. Have KCSE mean grade C (plain) and above. Have over 3 years’ experience in producing materials for teaching/training teachers – Audio, visual, radio script, voice auditing, microteaching preparations projects, ECT related workshops. Applicants must have a Diploma in Community Nutrition, Clinical Nutrition or Nutrition and Dietetics from a recognized institution. KCSE mean grade C (plain) and above. Be registered by the Kenya Nutritionists and Dieticians Institute (KNDI). A valid practice by Kenya Nutritionists and Dieticians Institute (KNDI). Applicants are invited for the post of Nursing Skills Laboratory Technician. A valid practice license from Nursing Council of Kenya. Be an active member of a professional body. Clinical teaching experience will be an added advantage. Applicants are invited for post of Public Health Officer. Have 5 years as a Public Health Officer. Be a member of the Association of Public Health Officers. Have a valid practicing license. MBA (finance option) or any related field from a recognized University. At least five (5) years relevant work experience in the Finance Department of an institution of higher learning, public or private sector. Demonstrate competence in International Public Sector Accounting Standard (IPSAS). Must have competence in Micro soft Navision accounting/finance modules. A Masters degree (Human Resource Option) from a recognized University. At least three (3) years relevant work experience in the Human Resource Department of an institution of higher learning, public or private sector. Demonstrate competence in Human Resource Information Management systems. Be registered by a professional body. A Bachelor’s Degree in Business Management (Human Resource Option) or equivalent from a recognized university. At least three (3) years relevant working experience in an institution of higher learning, public or private sector. At least five (5) years in a busy commercial farm enterprise. KCSE mean grade D (plain) or above. At least two (2) years experience as a farm worker. At least two (2) years’ experience in an institution of higher learning. Two (2) years administrative experience in an institution of higher learning either private or public. Demonstrate competence in Management Information Systems. Bachelor of Commerce or related degree (with an accounting option). At least 2 years’ experience in Internal Audit of public institutions. Excellent analytical, interpersonal and report writing skills. The ideal candidate must have excellent knowledge of the current auditing standards and practices. A Diploma in Institutional Management or equivalent professional qualification from a recognized institution. At least six (6) years’ relevant experience. Computer literate and ability to generate housekeeping reports. KCSE D+ (plus) and above. On-the-job training or service in the disciplined forces. At least four (4) years’ relevant experience. KCSE Grade D+ (plus) and above. At least two (2) years relevant experience. Successful candidates, for the above positions, will be offered a competitive remuneration package, including house allowance and other benefits in accordance with Meru University of Science and Technology Terms and Conditions of Service. Applicants should submit two (2) copies of applications specifying the post together with a detailed curriculum vitae (detailing academic qualifications, professional experience, academic leadership, publications, project grants and awards/scholarships, linkages and community service, e-mail and telephone contacts), copies of certificates and other testimonials. They should also provide names, telephone numbers, contact addresses and e-mail addresses of three (3) referees. Applicants for academic positions are required to indicate whether to be considered for full-time, part- time or adjunct. Applicants must obtain clearance from the Kenya Revenue Authority, Ethics and Anti-Corruption Commission and a valid Certificate of Good Conduct from the Kenya Police Service and submit them with their applications. Applications in hard copy and referees’ confidential reports should be sent to the undersigned to be received on or before Wednesday, 11th October, 2017.